Are crêpes making a comeback? 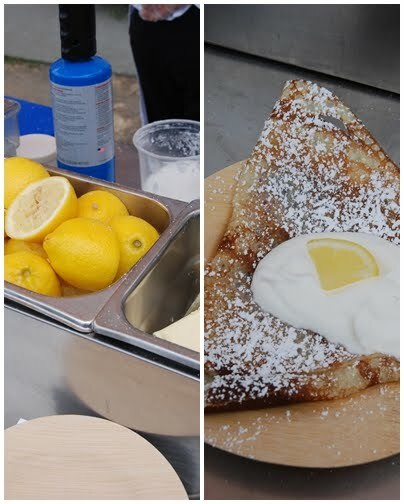 Last year in Seattle, I tasted exceptional Lemon Sugar Crêpes at a food cart called Anita’s Crêpes. After cooking the crêpe on a large griddle, she squeezed fresh lemon juice on top and sprinkled some sugar that was then brûléed with a torch. Finally, a dollop of whipped cream and heaven was served. Yum. Crêpes I love. Pastry cream not so much. Why do many French desserts have pastry cream and booze? And flambé. I have to say, flambéing is fun. But, whoa, I would use less Cointreau. To make the crêpes, I whizzed all the ingredients in my blender and then let the batter rest while I made the pastry cream. While waiting for the milk and vanilla to come to a boil, I whisked the yolks and sugar and then added the flour and cornstarch. [The smell of this flour mixture is, well, flour-y, so I was a little worried about the final result.] I slowly poured the hot milk into the egg mixture while continuing to whisk it using my stand mixer. When all was blended, I transferred it to a pot to heat until thick. Simmering it an extra five minutes helped to cook the flour and thicken it even more. 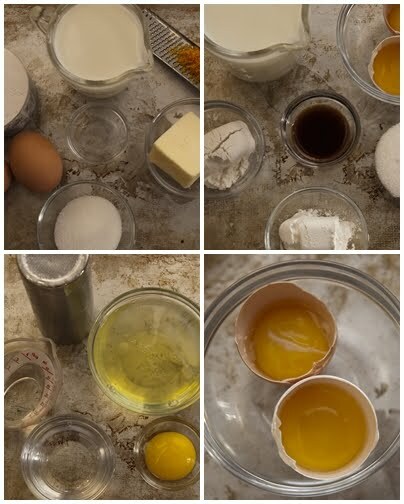 The pastry cream needed to be cooled before adding the whisked egg whites. [So I went for a walk with my dog.] When I came back, I set the oven at 350°, folded the egg whites into the pastry cream, and assembled the crêpes. It was ready after 15 minutes in the oven. Then it was time to flambé. I heated a couple of tablespoons of Cointreau and lit it with a match. When the flame went out, I poured it over the crêpe. Dessert was done. You can find the recipe for Crêpes Soufflées au Cointreau (Souffléed Crêpes Flamed with Cointreau) in the book Le Cordon Bleu at Home or here. I love anything wrapped in a crêpe. By baking these in the oven for 15 minutes, they were crispy and even tastier. My imagination is going crazy thinking of the combinations I could put inside the crêpe instead of the pastry cream. Plus this could be an easy make-ahead dessert since the crêpes can be made early and stored between sheets of waxed paper. 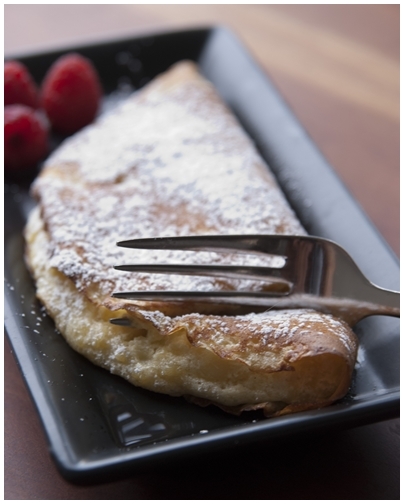 • Food Wishes:How to Make Crepes - Even the Messed-Up Ones Will Be Perfect! My favourite crepes are with ice cream and chocolate sauce. The lemon crepes sound tasty too. I like the tip about putting them in the oven to make them crispy.